Practically every baby brand has put out a pack n play for babies and all of them come with so many newfangled extras, it can be hard for a new mom to know what is best and how to pick out a playard. Even seasoned moms may want a little help deciding which pack n play has more pros than cons. If you want to skip to the juicy details now, my personal favorite is the Joovy Room 2 because it’s easy to use, no extra unnecessary frills, and twice the size of the other options. The price isn’t super high either, which is definitely a bonus. No matter the name- playpen, playard, or pack n play- we have the list of the best. These are not in order because every mother has different needs. We did all the research for you. Both the good and the bad of each option is below. If you do not see a popular playard on this list, then it was not good enough to make the cut! 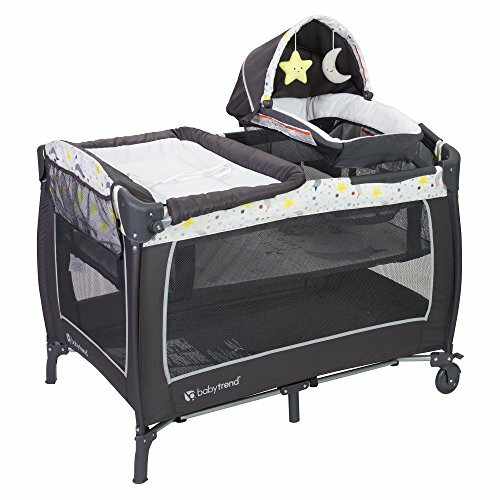 Is a pack n play the same as a playard? 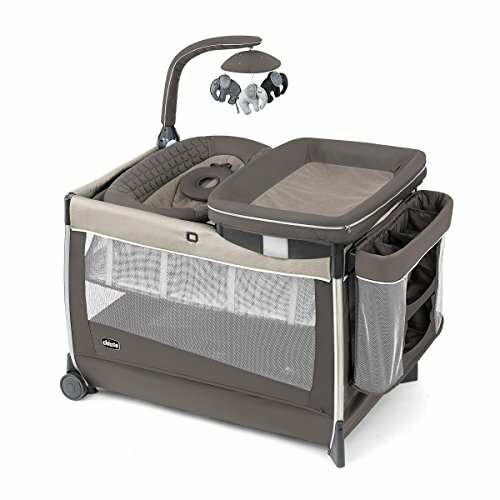 At what age can my child use a pack n play? How can I check for recalled playards? Are pack n plays safe? Is it safe to use sheets in a pack n play or play pen? Are pack n plays only for play or can they be used for sleep too? Graco often produces the most useful baby products and their playards are fabulous. 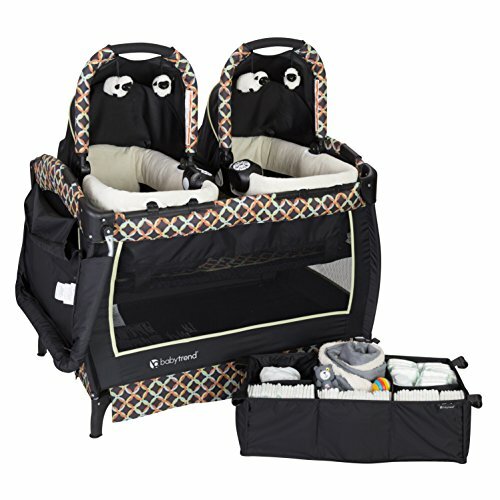 Their best is the Graco Pack ‘n Play Newborn Napper DLX Playard. Packed full of unique features, you will love a playard that is useful from day one of your baby’s life. Babies tend to need a lot of furniture that only maintains its usefulness for the first year or two. This pack N play will last up to three depending on how precocious your child is with climbing. My first child began climbing out of stuff at nine months old. My middle child never tried and the youngest got the others to pull her out! Once your baby can climb, a playard mainly becomes a place for napping during travel. Still useful but no longer something to keep baby out of trouble. The changing table is by far the best feature on this playpen. Not to mention a little side storage caddy for storing diapers, wipes, diaper rash cream, or cornstarch for sensitive skinned babies. Beyond the comfy and roomy changing space, the playpen has a napping station for newborns, a second for older babies who cannot sit up on their own. Third, the station turns into a regular playard. Very useful. Finally, this unit comes with a little sounds system for babies and even vibrates to soothe baby to sleep. All of the features above make this an excellent buy and all for a very reasonable price. Here is an overview of the features. As already discussed above, the pen includes a removable changing table and newborn napper. The napper even has an overhead toy bar with detachable soft toys and extra cushioning. If you take out the newborn napper and the changing table, you will find a built-in napper taking up the entire playard. Do you know what that means? You can use this as a sort-of side sleeper in your bedroom. The baby is easier to reach for nighttime nursing sessions. Do remember though, do not use once a baby can sit up on their own. The playard, of course, functions as a playard once your baby is old enough. Let’s go back to the newborn mode for a moment though. With the infant insert and the newborn add-ons, once side of the mesh zips down in a rainbow shape to store blankets, clothes, and any other baby stuff you need to store. When you are ready to use the playard as a play space for older babies, this storage compartment comes out completely and you can zip the mesh part back up. For more storage, put diapers and wipes in the outer storage cubby. Next, each side of the playpen offers full ventilation with mesh. Also, the entire pen folds down with one button before putting in a convenient storage bag. The napper may not be as useful as advertised. With no real structure, the napper insert is not supportive enough to keep baby in a safe position. The added components to make it more comfortable and useful for the newborn stage are added pieces you will need to store. If you already have a changing table, bassinet, and storage, then none of these components will be necessary. If you travel a lot or have a low budget, this could be your all in one. Next, many customers complained this playpen is a pain to put together. The struggle is real. I had a Graco and while it was incredibly useful, tearing it down and setting it up again set my teeth on edge. Lastly, the added components do not fit into the storage container. That’s a fail. 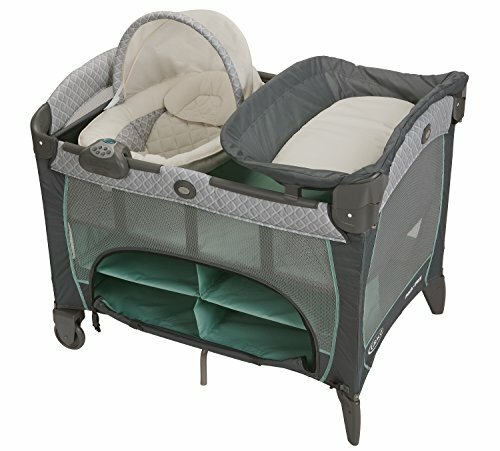 The Graco Pack ‘N Play Playard with Reversible Napper and Changer is a close sibling to the playard above. The only difference is instead of the baby changer and newborn napper being separate, they are once piece that flips over. Also, the storage and music were not included with this model. The Cosco Funsport Play Yard is simple at it’s finest. Are you a mom who doesn’t want all of the added components and you just want a place to put your baby that’s not on the floor or the crib? Here you go. This pack n play is for you. 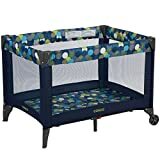 No changing pads, no storage, no newborn stuff, just an affordable playpen to fill with toys and a tot. You get to pick from 13 different patterns. Some that don’t make you want to scream which is totally a bonus. What’s special about this playard is the lack of extras, because sometimes, if it’s not broke, don’t fix it. Playards serve the purpose of a safe place to keep your non-climbing baby or toddler. A great piece of furniture to keep in the living room or in a back room, near the family but not able to cause trouble. Lot’s moms already purchased or given the gift of a changing table, bassinet, and all the other furniture. A playpen with all the bells and whistles would just be overkill. Besides, if this isn’t baby number one, you already know all that extra stuff outlives its usefulness long before you are done paying off the purchase on your credit card. What’s so great about a simple playard with no extras? It’s lightweight for one. Second, it’s easy to move. Take this into the kitchen or the dining room, or even the laundry room so you can catch up on socks (or cheat and buy new socks here). Next, setup is easy-peasy taking less than a minute. Graco’s playpens claim to be easy to put together but we seasoned moms remember the struggle. The playard sports a shiny pair of wheels to move the pen around with ease. Okay, the wheels aren’t really shiny, more of a matte finish. As expected, the pen includes a storage container bag for easy travel or storage. Finally, air ventilating mesh surrounds the entire pen. A few complaints rolled in stating this playpens mat is anything but comfortable and comes with more than the three creases you find in other playards. When brand new, the pack n play can smell funky like chemicals. Sorry, my friends, plastic can smell strange. Let the pen air out for a while before using and do not spray with anything. If you want to clean with a mixture of apple cider vinegar and water to help reduce the smell. Or it may just smell like a chemical plant next to a vinegar distillery. Finally, some customers experienced a gap between the mat and the base. The Delta Play Yard is a square playard. Delta decorates this pen with tons of eye-catching jungle animals to entertain your little one. Although let’s face it, the jungle pattern isn’t going to entertain children for more than a few minutes before they start crying to get out and it’s not going to your decor style a whole lot of good. If however, you run a daycare in your home or plan on putting this in a baby specific room, then this uniquely shaped playard may be a good fit for you. Most playards are rectangular in shape and offer length for naps but not a whole lot of space for play. 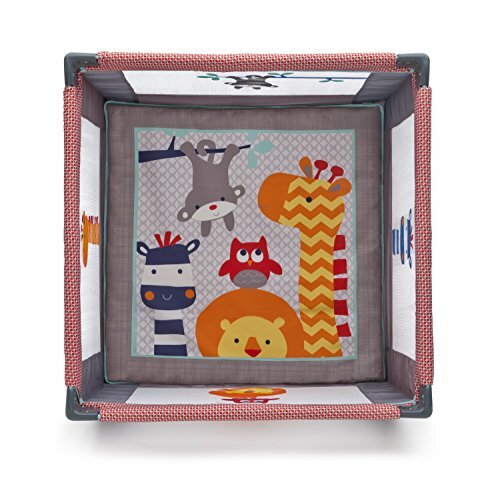 This square playard is a perfect 36 x 36-inch square. That’s a bigger less confining space for your baby. Or if you have twins (who don’t like to hit each other with toys) than two babies can fit in this playpen together. Lastly, this one has animals decorating the mesh as well which is not a feature on other playpens. As with all playards, your child can safely use this pack n play up to 30 lbs and up to 35 inches tall. Also, this one includes a mattress for sturdiness and a storage bag for storing or traveling. This one is not lightweight though, at 28.6 pounds. Maybe keep this one in one place as that’s heavy especially if you have a toddler or infant in tow. You will be happy to know this meets all JPMA certified to meet or exceed all safety standards set by the CPSC & ASTM. Finally, if you need to wash this pen (you know this will become part of your regular schedule) spot clean only. Use baby wipes for quick cleans and all-purpose spray for killing bacteria. Only two complaints come with this portable crib. First, the padding is a bit thin. Second, the folding mechanisms do not always cooperate. A little WD40 may help with the second but make sure to clean excess spray off the fabric as you do not want baby licking this concoction. This mattress pad for square playards could make the playpen more comfortable and hypoallergenic for your baby too. In the theme of square playards take a peek at the Joovy New Room2 Portable Playard. For a little more money than the Delta square playard above, you get a host of helpful features with this Joovy. Regular sized playpens are like a tiny home and this is a spacious house in the suburbs. Lot’s of space for one baby or even two! While this playard is definitely portable, the point of this pen is the size. Babies are often trapped in confining furniture to keep them out of harm’s way and out of trouble. This is a way to keep them locked in but make them not feel so locked in. As a matter of fact, your baby will actually have room to move around or dance to whatever music is going on in the room. Pop some toys in and let your little one play all with a 360-degree view. This playard is almost 50% larger than most traditional playards. It’s even a little bigger than the one above by nearly an inch around. Joovy’s playpen offers over 10 square feet of play and sleep space. Some babies and toddlers are like cats. No matter how tiny they are they take up a lot of space. So much you often wonder how they can take up that much space! Also, this has enough space for twins who refuse to be separated. Speaking of twins. If you have twins add a little upgrade to this playard with the JOOVY Room2 Twin Nursery Center. This offers a place for newborns to sleep side by side and a convenient changing table, which holds up to a 25-pound baby. You can also purchase a JOOVY Room2 Waterproof Fitted Sheet to protect your investment from leaks and spills. The padded mattress is heavy duty and made for a low center of gravity to support babies from birth up to 35 inches. This playard includes a soft cotton fitted mattress sheet for keeping your baby’s space clean. Of course, this folds up and has a storage bag for putting in the closet or taking to grandmas house. Finally, the simple design blends in with any decor. Like with the Delta playard, this one borders on 30 lbs because of the added size. As with most playards, the main issue with the Joovy playard is locking the sidebars into the upright position. A few customers complained of the plastic smells that comes with a new pack n play. Others were upset that the pack n play was a bit lumpy and babies had a harder time walking around this pen. If you are looking for a truly portable playard check out Summer Infant’s Pop N’ Play Portable Playard. 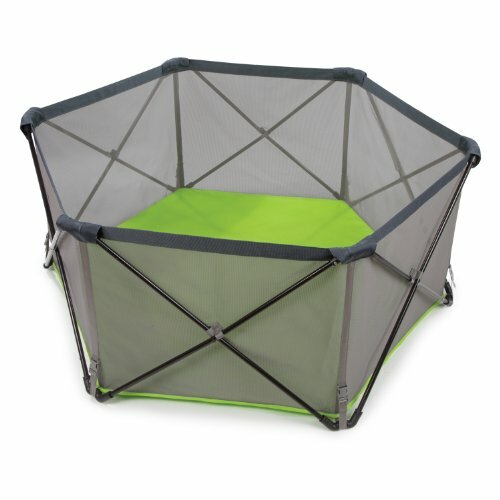 The unique hexagon shape of this playpen allows for easy fold up in second thanks to the use of clips and strategically placed poles. 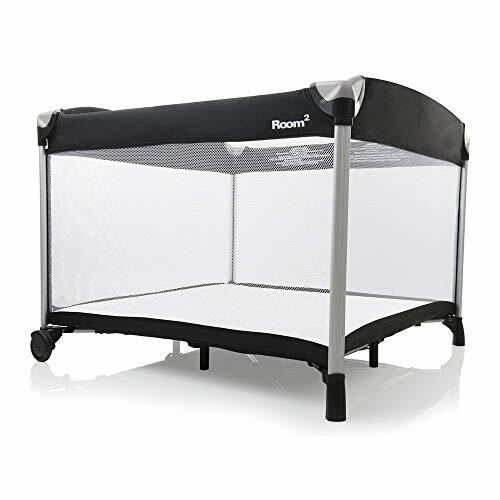 This is the perfect playpen to take to the beach or just to spend some time in the backyard while still keeping your little one safe. Even better, you can purchase a half or full canopy for this playard for shade protection from the sun. Finally, this playard is the perfect size for two little friends to enjoy a lazy sunny day together. Using a crisscross metal bar frame instead of a standard rectangular frame, this playard is able to become ultra-light and easy to assemble or disassemble. The hexagon shape alone makes this product special but the easy of taking for a trip into the woods or the beach will keep mom’s content knowing their baby is safe. If you remember the Joovy from above, it offered 10 square feet of play space, but this design offers 14 square feet because it is 48 inches wide. What a useful invention! Would even work great as a ball pit to be packed away when not in use. The great shape and size make this the most portable pack n play and the easiest to set up. As a matter of fact, set up in under a minute. Another great feature is the playard comes fully assembled so no trying to figure out where all the poles go. The fully mesh sides are another reason for the lightweight design. The mesh also improves babies line of sight. They hate not knowing what is going on in the world surrounding them. The bottom is made of canvas to survive inside or outside even in rainy conditions. Finally, when your baby has outgrown this playpen, save it for the cute Pomeranian you plan to get. While this pack n play can be used inside, it’s meant more for outside with the large size. Most homes do not have enough room between furniture for an extra 48 in hexagon shaped playpen. Also, this design has no padding or mattress pad to remain ultra-light and portable. Sure, your baby will be okay with the hard and uneven ground for a little while. Chances are strong though, a baby will begin to complain before long. Next, the length of the item is a couple of inches shorter than standard designs, meaning your baby may be able to crawl out of this playpen sooner. Lastly, the lightweight of the pen means this is better for sturdier babies who do not need any more than walls to keep them in but not support from the walls. 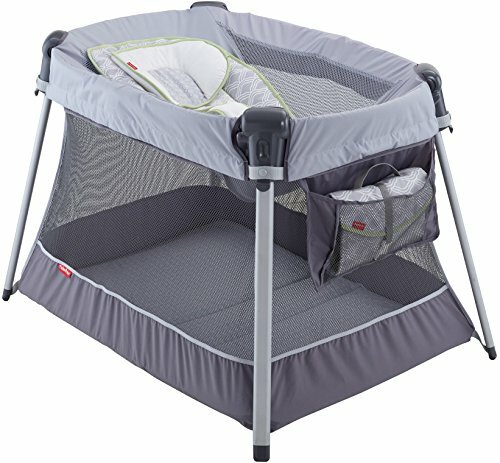 If you liked the Graco Newborn Napper above but want a smaller price, try the Baby Trend Lil Snooze Deluxe 2 Nursery Center. This playard shares a few similarities with the Graco playard but with a more affordable price tag for those with a lower budget. 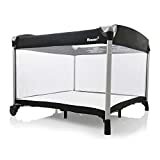 One similarity is the ability of this playpen to serve as an all in one infant center for changing, napping, serving as a bedside co-sleeper, all before turning into a regular playpen. With so many features, purchasing a crib, changing table, and bassinet pretty much become obsolete making this even more bang for your buck. While similar to the Newborn Napper, the changing table on this playard folds out and down to put it out of the way when not in use. What a smart way to save some space especially if you are using this as a space saver because of limited room in your house. The HALO Dreamnest Open Air Sleep System is another pack n play that can really grow with your child and save you some major space. Click the link to read our review. First, you will love picking from several themes, all with beautiful patterns on the playmat. I already told you all about the changer but did not mention the external storage spot for diapers and wipes. Next, you will love the newborn napper to keep your newborn nearby comfortably. As to be expected, the napper and changing table will only work for about the first three months of your babies life. The napper is removable once your baby outgrows the little bed with canopy and two plush toys. Then you can use the infant napper for babies who cannot sit up on their own. Once your baby is more mobile, move the mattress pad down to the bottom of the playpen to allow full access and room to play. All the typical features are included. First, it includes full mesh sides. Next, the pen completely folds down and includes a storage bag for travel or storing out of the way. The bottom has wheels on one side for easy repositioning and brakes to make sure older sibling do not try and push the baby around in the pen. Finally, this playard is a little bit deeper than other brands, meaning it will last a little longer before your little one can climb out. As with all playards, this one can be difficult to set up. The secret is to push in the smaller sides first and then the larger sides after. If you try to do the larger sides first you will run into issues. Otherwise, this playard comes with almost no complaints. However, if you wanted the sound and vibration bar like on the Graco model you’re out of luck. Mothers across America will rejoice! The 4moms breeze GO portable travel playard is the easiest playard to fold or unfold ever. The 4Moms company came about to dramatically improve juvenile furniture and it looks like they have reached their goal with their Breeze playpen. The company offers three playards. Today we will discuss the Go. If you want a bassinet you will want the breeze classic and if you want a bassinet and a changing table, you will want the breeze plus. The main difference between this pack n play and others is the ease of opening or closing. If you have never used a playpen I will explain the process. For those of you who have battled playpens move to the next section as this description may trigger anger and annoyance. First, remove the play mat and place out of the way. This might be as simple as removing the playmat and placing on the floor unless the mat is velcroed into place. then you have to reach under, remove the velcro then remove the mat. Next, you need to push the middle stabilizer up, this is under the mat and on the floor. This makes the playpen wobbly but also makes it so the sidebars will come down. After all that its time for the real battle. Sidebars versus All Moms Ever. Start with the wobbly playpen tucked by your legs for some fake support. Through the fabric feel around on one of the two smaller sides for the push button or release function and then push up and then down. If it behaves. Do this to the other short side. Now, you move on to the two large sides. It may or may not work on both sides. One side may develop a stubborn nature all the while, the legs are scratching up your floor, your shins and the nail polish on your big toe. This has happened. You’re not done yet. Now balance the folded up playard against your body while wrapping the playmat around the body and latching the velcro around to keep it in place. I’m not even going to get into the struggle of shoving the whole playard into the bag. The memory is too traumatizing. Please use your imagination from here on. Now that you know the struggle, let me reiterate, this playard is a one push open and one pull close. Let the information sink in. The sides offer full visibility to keep baby appraised of his surroundings. There is mattress pad on this pack n play and by necessity, the pack n play is larger than other standard models but not to the extent of the Joovy. Also, the playmat does velcro to the base, but on the outside, so removal is easier. You can purchase extra sheets for the playmat. Its great to have one in the crib and one to wash. Some days you may even want three. Finally, the playard’s simple design will not obstruct the room it’s in or the decor. A simple classic look with clean lines. The inside of the pen does have a few slightly sharp points in the corners but should not harm your child as they are rounded off and point inward toward the cushioning. One minor issue is the lack of wheels to easily change the position of the playpen. The price is about the only other issue that could be a deterrent from mothers wishing to purchase. For Mickey and Minnie fans we have found the perfect playpen for you. Disney Baby Sweet Wonder Play Yard with 3 Tiers of Storage. Not only can you have your beloved mouse design but this playard comes with all the fun extra features moms love for the first three months of a babies life. This can be your complete baby center to use for changing diapers, naps, and as a pen to keep baby safe from the dangers in your home. The mouse is what makes this playard special. Disney created both Mickey and Minnie playards in multiple colors and patterns for die-hard fans who want to share the magic of Disney with their children. The patterns are Mickey or Minnie without going over the edge into garish including the playmat with a larger Minnie or Mickey pattern. With six color options available you will find one you love and will suit your decor. The features are fabulous and extensive. Basically all of the features you love from Graco’s napper but without the napper and the internal storage. The playpen features a sturdy changing table, an infant level napper that later converts down to be a normal playpen. This model also includes a removable toy bar to keep babies attention. The best feature though is the external storage container. It’s very large and roomy for holding lots of diapers, a few changes of clothes, wipes, creams and anything else your baby may need. Next, the wheels on one side allow for easy repositioning. Finally, the playpen folds up and includes a storage bag. This pack n play is pretty heavy in comparison to other models. Those mouse ears must be really heavy. Otherwise, like with most playpens, a few customers received defective products or had issues folding the item and unfolding the item. As can be expected, the storage caddy is soft and not the most sturdy item available like a dresser, but very useful for its purpose. 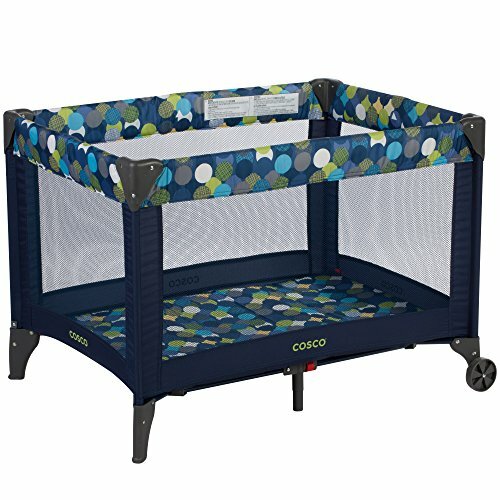 Chicco’s Lullaby Dream Playard is a luxury all-in-one playpen with everything necessary to make the first three months easier and then it turns into a pack n play for your baby to toddler. It’s a lot like the Graco Newborn Napper but with better functionality which is a good thing as the price is quite a bit more. Don’t bother with this model if though if your baby is older than three months as all the add-ons will be wasted. Let’s go over the benefits. The electronic toy bar makes this playard special. Not just calming music, but also a nightlight. A nightlight! Let that sink in! Take a peek at the baby without fumbling around with your phone to turn on the flashlight function. Think about how useful this could be in the night when the baby wakes up hungry. The other brands haven’t caught on to this almost basic idea and yet not included in any of the other models listed. Also, the electronic toy includes nature sounds and a toy mobile with detachable plush elephants. Lastly, the newborn napper comes completely off the playard and folds out a pair of legs to turn into a bouncy seat for your baby. The number of relevant features in this playard will astound you. We already discussed the electronic toy bar but want to make sure you do not forget this fabulous attachment. Next, the changing table has an actual support board zipped in. The fabric zips off for easy washing and is detachable or you can fold it down out of the way. The pen also comes with an exterior storage spot for diapers and wipes. Next, the mattress also has boards in it to keep it sturdy for your baby cover by a machine washable mattress. Like a few of the others, once the baby is no longer a newborn you can keep the mattress pad a little higher to keep baby close until the baby can sit up on his own. Two wheels allow for easy moving. Pack the playpen up and store in a provided bag for storage and travel. Finally, the sides are full mesh for ventilation and a view. This playard is very heavy, a good ten pounds heavier than the other brands available. Heavy can be more sturdy and we know for a fact this model includes support boards which is where the weight comes from. You will need three AA batteries for the electronic mobile. Finally, a few customers complained about the cumbersome process of setting up the frame but we have seen this with the majority of the pack n plays so far. Finally, the planks may add stability but also make the mattress less comfortable you may need a mattress pad for comfort like the Milliard Memory Foam Pack N ‘ Play Mattress. Chicco also makes the great Chicco Fast Asleep Playard, which we have reviewed for your convenience. 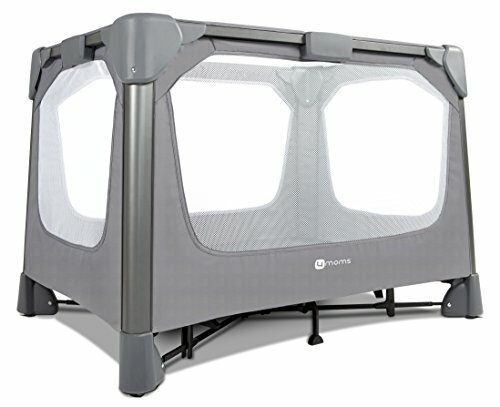 Frequent travelers may want the Lotus Travel Crib. Anyone who has traveled with a baby will know the struggle. Traveling with an infant requires a moving truck just to go to a friends house for the afternoon! This playard takes away the need to pack up every bit of baby stuff in your house. Anything to make adventures into the world is a major plus for parents. This playard is in a class all its own. First, this pen is the lightest available at only 13 pounds. Even better, it packs up quickly into a case with shoulder straps. How convenient! Next, the setup takes only 15 seconds (they call it 3D folding). Health conscious parents will love that this playard is certified safe and non-toxic. This is the only playard with GreenGuard Gold non-toxic certification, which means low VOC, no lead, phthalates, PVC, or heavy metals. Another great feature is the quiet side zipper door for easy access to baby on the floor so you can cuddle, nurse, or sleep next to your little one. The zipper locks when you’re done. Finally, you can carry this fabulous travel playpen into the airport and check it at the gate. Finally a bed you can take to the hotel with you. Sure, most hotels offer a baby bed but who knows how many germs are in that thing. The hotel bed certainly does not have near as many features either. Beyond the features mentioned above, this frame is made of sturdy but light aluminum. Next, the fabric and mesh cover zips on and off for machine washing. The mesh goes up all the way to the top for full surround viewing and full ventilation. The frame can be used for either this playard or the bassinet. Lastly, the pen includes the mattress to give a baby a good nights sleep. The playard will serve you for years to come for multiple babies and make a great addition to your travel plans. The zipper can stick for some customers. Spray a little WD-40 on it for lubricant and the problem should correct itself. You can also try these tricks. Next, the company sacrificed a thicker mattress for travel. Most babies do not need as much padding as adults. Honestly, they became quite accustomed to small tight spaces. The reason so many options exist is because one playard will work for some folks and others will need a completely different option. For those on the road often, the travel qualities will appeal despite the flaws as all playards have a flaw somewhere. Finally, the price is a bit expensive but not out of the realm of possibility. If this playpen is out of your price range, try the BABY JOY Baby Playpen instead for similar functions but less than half the cost. If you want more of a bassinet option, check out our Best Portable Bassinet list. Having a set of twins? You just might need the Baby Trend Twin Nursery Center. The playard is not any larger but this model comes equipped with options for twins. 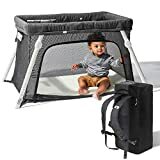 Think of the money you could save in the first few months by just purchasing a playpen with some add-ons instead of two bassinets and all the other necessary gadgets and gizmos. The only real issue with this model is the playard is not big enough for two babies for very long as a playard. You may want to consider the Joovy Room2 if you plan on placing two older babies who can sit up unsupported in the playard. The Baby Trend Twin nursery will be fabulous for those first few rough months and even until your babies are large enough to want a little space. This model comes with two removable rock-a-bye bassinets. Even better, both convert to stand alone rockers. These are no ordinary bassinets either, they almost look like soft plush bassinets but without the legs and come with a canopy with a couple of toys for stimulation and a carrying handle. Not only are the bassinets pl.us but also include mesh sides for ventilation. Also, they both come with include an electronic music center with volume control, nightlight, and vibrations. I love finding another set with a nightlight! Especially with twins. You may need to see which one filled the diaper or make sure you are grabbing the right baby for middle of the night feedings. In addition to the lovely bassinets, the set includes a fold-down changing table. You do not need to remove a bassinet to use the table. It folds out for use on the outside of the playard. Other features include an extra large diaper caddy for twice the amount of diapers and wipes. The inner mattress pad can stay at the halfway mark for infants unable to sit up. As with the majority of playards, this one has mesh sides for ventilation and to allow baby to see out. Also, the unit includes wheels on one side for easy repositioning. Lastly, the actual playard folds down for storage in the included bag. The other piece will not fit in the storage bag with the pen. The playard is only large enough for one baby once the bassinets are taken out. You will still need either a second playard or a larger playard for both babies when they are ready to sit, stand, or play. This is a great set for infants, not so much for older twins. 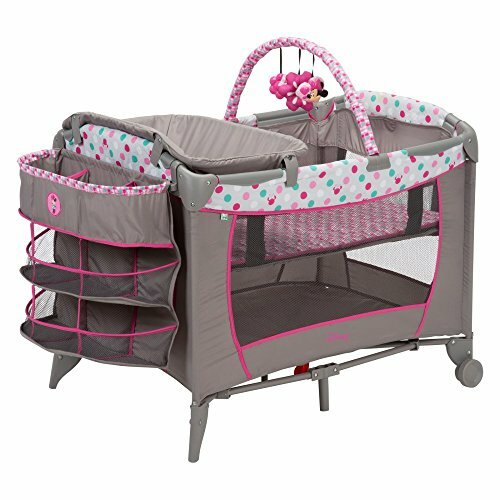 Also getting another playard to match this one with the same pattern and not the hefty price tag with the add-ons may be a difficult task. Even the raised bassinet is for one baby. Also, the bassinets may only work for a month or two up to about 15 pounds and babies reach that milestone pretty quickly. The Fisher-Price Ultra-Lite Day and Night Play Yard kind of looks like the Lotus playard but with a couple of added bonuses. Fisher-Price is well known for toys for babies and also space saver highchairs (from our Best High Chairs for Small Spaces article) but now they are branching out to other useful baby items and this one looks quite resourceful. The top fold-over newborn insert is different than the ones seen on the other playards. For one, it takes up the entire top and looks like a little baby hammock with a positioning insert. The newborn insert pad is machine washable. Also, at just 15 pounds, this is the second lightest playard on the list. Finally, while this playard does not have a changing table exactly, it does include a built-in spot for the included changing station diaper clutch with built-in wipe container. 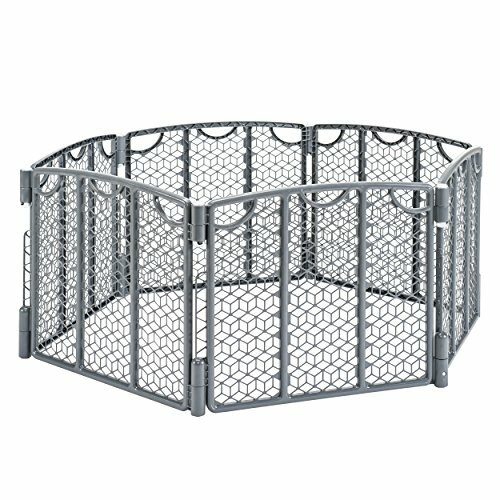 The newborn sleeper is nice and so is the lower weight, but this playpen offers a few other nice features. The playpen folds up into more of a square shape for easy flat storage and may even fit better in a car. The bag includes a shoulder strap for easy carrying. As well as working for newborns, the playard can be used for toddlers. Next, the mattress is quite plush and the baby will love looking out the mesh sides. The playard is a bit smaller than other brands but you sacrifice space for portability and ease of setup. If you often travel over to grandma’s or a sitters house and need to bring a playard this is a great option. Also great for taking to hotels or traveling far away. While this does not fold up into a backpack like the Lotus, the playard does include the added changing mat and the newborn insert for more options. Although, you do need to change baby on the floor with the included mat, at least not on cold tiles! The incline sleeper on top only works until your baby can roll over which could be very early for some babies. At least it rolls up for the most part for easy storage for another baby in the future or for resale value. Also, the bottom of this playard is very close to the floor. I’m not sure why this is an issue but came up a few times as a customer complaint. A few people complained of mold issues, with the brand, and with the playard. I find the tapering off at the top disconcerting. The base is rather large but the top is quite narrow and may make a baby feel uncomfortable. If you are looking for a non-traditional playard, take a look at the Evenflo Versatile Play Space. Use this versatile play space inside or outside and keep your little one in a safe space. While this does fold up, it’s completely different from the playards above as it doesn’t have a bottom and is not a simple rectangle or square. Instead, this is more like a fancy fence meant to set specific boundaries for your child and all from a very affordable price. This is not a playard per se but works like one. Keep your baby where you want them but without all the hassle of setting up a playard. Set up the fence where you need it and use some padding if you like or let the baby sit on the floor. You can buy extra fence sections to enlarge your babies play space. The great benefit of this fencing is you can place multiple children. also, you can change the shape to suit your needs, unlike a fold-up playard. Finally, the bottom connectors between each section of fence include an ejectable stake to secure this play set in the ground for outdoor use. Babies need lots of vitamin D from the Sun and now you can set this up outside to give them room to play in the grass and enjoy a little sunlight. We already discussed the stakes for outdoor use but this set also has floor pads for indoor use. No one wants to scratch up their floor! The most spacious playard above with 14 square feet and this play area offers 18.5 square feet and the ability to expand! Now mind you, this play area is not meant for babies under 6 months old. Babies need to be able to sit up unsupported for this play fence. The recommended age is 6-24 months. Next, you won’t need any tools to assemble the play structure because of the unique hinge design with quick connection and smooth pivot. The fencing can be folded down for easy storing or travel. Each panel has three handles for easy repositioning. Using couldn’t be any easier. Set up where you want and connect the sides. Done! Pop a few toys in and maybe a blanket for comfort. After, the six panels fold-up to save on space. Last of all, the pieces are sturdy but not overly heavy at close to 17 pounds and you can pick from multiple colors. As you can imagine, this item will not be useful once your child can climb. This is not meant to be used for supporting the baby on the actual fence. Before your baby starts climbing would be a great time to start teaching the word no. Babies will crawl out of a traditional playards as well as bathtubs, cribs, and anything else you put them in once they are capable of climbing. Finally, babies and toddlers can push this to a new location. Not a huge issue especially if they no the word no, but do make sure this is not set up near stairs for safety reasons. Try the Baby Care Play Mat Pen if you would prefer more weight to the fencing but it does come with an extra large price tag. It does work well with the Baby Care Play Mat but for another costly price tag though. Are you giving birth to royalty? Even a duke or a duchess? They may need the Big Oshi Portable Playard Deluxe Bundle to show of their status quo. 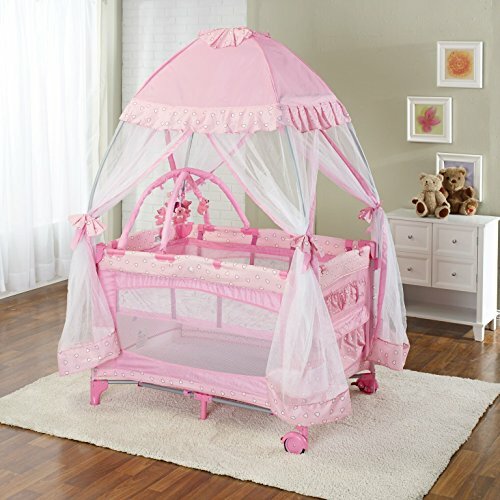 This over the top playard brings in a canopy, ruffles, bows, and all kinds of style. Not necessarily my style, but man if my now seven-year-old little girl could have had this fancy little pen, she may have wanted to stay in there forever! Judge for yourself is this is tacky or adorable, either way, it includes a lot of nifty features. Beyond the overwhelming amount of poofy decorations, this playard does offer a few advantages. The rather fancy curtains surround the entire playard are made of netting perfect for taking your little one outside in the summer to keep the bugs off. Even better, the ruffly canopy would keep the sun from shining too brightly on your baby as well. The man difference between this playpen and all of the others is all the extra designs. Also, you can pick from four colors pastel pink, polka dot purple, light blue, and navy blue. Each has a corresponding pattern plus ruffles, bows, edging, trim and enough under skirts to feel like a southern belle from the 1800s. You will love the price as its super affordable. Also, this model includes a criss-cross baby mobile with plush toys. Use the newborn insert until your little one can sit up on their own and then lower the bar down to the bottom to use as normal playard for older babies and toddlers. As expected, this fancy playard still comes with the standard features. First, the playard folds up and can be stored in the included storage bag. Next, one side has wheels for easy repositioning. Also, one side has some storage pockets for easy access to diapers and wipes. Finally, the sides have mesh all around for ventilation and easy sight for your little girl. The only real complaint beyond a few people receiving defective units was a few people who had difficulty putting the playard together. The quality is a little cheaper but if you want a fancy playard this is your only option. Babies can use pack n plays as soon as they are born. Many now come with newborn inserts but babies can lay in a regular pen as well. At birth though, pack n plays aren’t as convenient. Bending over after giving birth may still be difficult, having the baby up higher helps a lot. Playards can be used until a child is either 30 pounds, 35 inches, or can climb out on their own. Whichever comes first is a clear sign this pen will no longer safely contain your child. Most kids will be able to climb out around 18 months or earlier. You can sign up at the CPSC website to receive emails. Also, here is a list of recalled playards. Please comply with the recall guidelines for your baby’s safety. Do not continue to use a recalled playard and try to keep track of all baby furniture items that can be recalled. Yes. Pack n plays must meet specific standards. This is also regulated by CPSC. There’s now more information about new safety rules for pack n plays. Be sure to browse the CPSC site if you would like more information. To make sure you are using a safe play yard, do not buy one more than three years old and check to see if it has been recalled before accepting as a gift or buying used. Safety is very important. Yes, but if you use sheets in the play pen, make sure they fit well and are not excessively loose. Also, make sure the baby cannot pull them off. Both are safety risks and can cause suffocation. Sheets on a play pen, and also on a crib and bassinet, should be tight for baby’s safety. Check out our list of the Best Pack n Play Sheets! Yes, your baby can sleep in a pack n play. It’s best to take all loose stuff out of the playard when the baby is napping. This includes toys, blankets, and bottles. All of these can be a threat to sleeping babies. Otherwise, experts agree that this is the perfect napping solution for your baby. They can be close to you for easy checking. Also, pack n plays are by far more portable than cribs, so definitely a better option for a traveling bed for your baby. Overall, the Joovy Room 2 playard will meet the needs of most mothers. 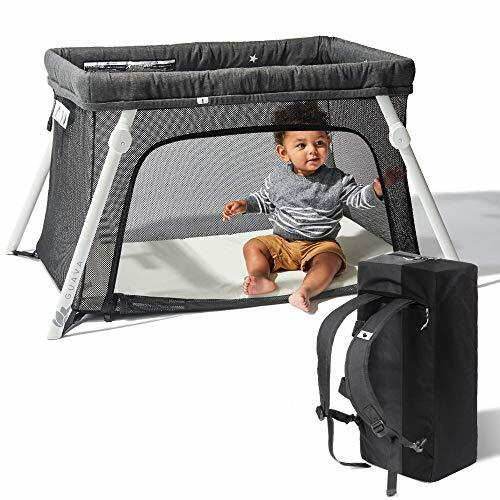 Although this pack n play offers quite a bit more play space for your baby, you may want to measure before purchasing to make sure you have space for a playard this size. The market offers so many options because parents all have different needs and desires, not to mention babies have different desires too. The pack n play with all of the add-ons like a newborn napper or changing table are nice but only usable for about the first three months of your babies life. Weight out the cost over the amount of time the baby will use the item and decides if the items are cost effective for your family. Baby Brezza Formula Pro Review: Does This One Step Food Maker Really Work? Pampers Swaddlers vs Cruisers: What’s the Big Difference?